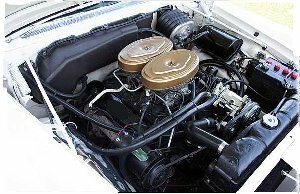 With the 1959 E Series, Chrysler replaced the heavy and expensive Hemi� with the new Golden Lion V8. This 413 cubic inch motor remained at 380 horsepower but torque was up over the 392-hemi. The new V8 sported Chrysler's new wedge-shaped combustion chamber design. Although displacement increased, the engine actually weighed 103 pounds less than the 392 cid Hemi V8 it replaced. Much of this weight reduction was due to the use of a single rocker shaft and the lighter and more compact cylinder head. A switch from a 25 quart to 16 quart cooling system also saved 18 pounds. The new engine continued using dual four barrel carburetors and the compression ratio was slightly higher (10.1:1) than the previous engine (10.0:1). The 413 Wedge also featured low-restriction air cleaners, heavy-duty valve springs and dampers, and a fluid fan drive. The Chrysler three-speed TorqueFlite remained as the standard transmission. Claimed acceleration was an impressive 8.3 second 0-60 time. The 300 E suspension continued to use front torsion bars and semi-elliptic rear leaf springs. New for 1959 were the 300 E's special Goodyear Blue Streak 9.00x14.00 tires. These tires were constructed of nylon, had a low cord angle, and a unique tread design. The 300 E's standard power steering, with 3.5 turns lock-to- lock provided sports car response. Little changed in the appearance of the 300 E from the previous model. The most significant change was the use of narrow horizontal red bars highlighted by four chrome bars in place of the older eggcrate grille. 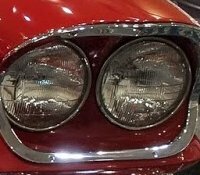 Red bars were also used in the narrow air scoops for the front brakes that were positioned below the headlights. Also new were the "300" letters located on the lower, driver side portion of the hood. 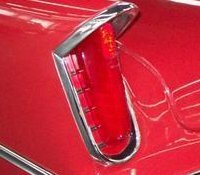 At the rear were new taillights and a larger bumper with recessed back-up lights. The 300 medallion was positioned near the front of the side sweep spear. Also new were wheelcovers with gear-shaped center portions. Inside, the instrumental continued the tradition of easy-to- read gauges with two large circular gauges. The left unit contained the odometer and the 150 mph speedometer. The right unit contained the ammeter, fuel, oil pressure, and water temperature gauges. The 300 E also sported a unique standard front swivel seats finished in a new natural tan "Living Leather" upholstery that used a basket-weave pattern. Its perforations were intended to allow air circulation in warm weather. The swivel seats were controlled by a lever located at the base of the seat and could swivel through a 60 degree angle to facilitate entry and exit into the vehicle. The 300 E was available as either a two dour hardtop coupe for $5,319, or a convertible for $5,749. Both came in six different colors: ivory white, formal black, cameo tan, metallic turquoise-gray, radiant red, or copper spice. The loss of the Hemi engine took its toll on sales, however, as only 522 coupes and a mere 125 convertibles were sold. 300E SERIES - (8-CYL) - Considered a part of the New Yorker series the big brute continued the tradition of luxurious, high-performance driving pleasure. Minor styling revisions and the use of a wedge-shaped combustion chamber engine were changes. The new engine was said to have performance equal to or slightly better than the hemi engine, which left no doubt as to the car's heritage. A revised grille, on the familiar theme, eliminated the vertical bar look. A 300 insignia was placed on the driver's side of the hood, in line with the headlamps. Swivel bucket seats were available and the red-white-blue medallion was positioned in its usual place. The letter 'E' was added to the medallion to signify the new model as the 300E. This was the last year for separate body and frame design. 300E I.D. NUMBERS: Serial numbers and engine numbers were located as on previous models. 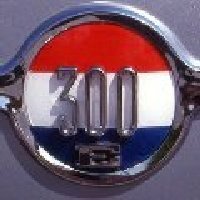 All cars were built in Detroit and numbered M591 -100001 and up. V-8. Cast iron block. Displacement: 413 cubic inches. Bore and stroke: 4.18 x 3.75 inches. Compression ratio: 10.1:1. Brake horsepower: 380 at 5000 R.P.M. Five main bearings. Hydraulic valve lifters. Carburetors: Two (2) Carter four-barrels Type AFB Model 2798S. CHASSIS FEATURES: Wheelbase: (Windsor) 122 inches; (Saratoga) 126 inches; (New Yorker) 126 inches; (300E) 126 inches. Overall length: (Windsor) 216.6 inches; (Saratoga) 220.6 inches; (New Yorker) 220.9 inches; (300E) 220.9 inches. Front tread: (Windsor) 60.9 inches; (Saratoga) 60.9 inches; (New Yorker) 61.2 inches; (300E) 61.2 inches. Rear tread: (Windsor) 59.8 inches; (Saratoga) 59.8 inches; (New Yorker) 60.0 inches; (300E) 60.0 inches. Tires: (Windsor) 8.00 x 14; (Saratoga) 8.50 x 14; (New Yorker) 9.00 x 14; (300E) 9.00 x 14. CONVENIENCE OPTIONS: Power steering (Windsor). Torqueflite (Windsor). Power brakes (Windsor). Power windows. Power seat. Swivel seats. Air-Temp air-conditioning. Custom super soft cushion rayon tires. White sidewall tires. Nylon and Coaptive Air tires. Stainless steel wheel covers on Windsor (standard on Windsor Town & Country). Remote control mirror. Radios. Antennas (including power antenna). Two-tone finish. Solex glass. Heater. Rear window defroster. Auto-Pilot. Windshield washer. Undercoating. Non-slip differential. Hand brake warning lights. Backup light (Windsor). Sill moldings (Windsor).